A botanical name is a formal scientific name conforming to the International Code of Nomenclature for algae, fungi, and plants (ICN) and, if it concerns a plant cultigen, the additional cultivar or Group epithets must conform to the International Code of Nomenclature for Cultivated Plants (ICNCP). The code of nomenclature covers "all organisms traditionally treated as algae, fungi, or plants, whether fossil or non-fossil, including blue-green algae (Cyanobacteria), chytrids, oomycetes, slime moulds and photosynthetic protists with their taxonomically related non-photosynthetic groups (but excluding Microsporidia)." The purpose of a formal name is to have a single name that is accepted and used worldwide for a particular plant or plant group. 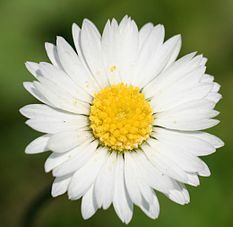 For example, the botanical name Bellis perennis denotes a plant species which is native to most of the countries of Europe and the Middle East, where it has accumulated various names in many languages. Later, the plant was introduced worldwide, bringing it into contact with more languages. English names for this plant species include: daisy, English daisy, and lawn daisy. The cultivar Bellis perennis 'Aucubifolia' is a golden-variegated horticultural selection of this species. A botanical name in three parts, i.e., an infraspecific name (a name for a taxon below the rank of species) needs a "connecting term" to indicate rank. In the Calystegia example above, this is "subsp. ", for subspecies. In botany there are many ranks below that of species (in zoology there is only one such rank, subspecies, so that this "connecting term" is not used in zoology). A name of a "subdivision of a genus" also needs a connecting term (in the Acacia example above, this is "subg. ", subgenus). The connecting term is not part of the name itself. ^ McNeill, J.; Barrie, F.R. ; Buck, W.R.; Demoulin, V.; Greuter, W.; Hawksworth, D.L. ; Herendeen, P.S. ; Knapp, S.; Marhold, K.; Prado, J.; Prud'homme Van Reine, W.F. ; Smith, G.F.; Wiersema, J.H. ; Turland, N.J. (2012). International Code of Nomenclature for algae, fungi, and plants (Melbourne Code) adopted by the Eighteenth International Botanical Congress Melbourne, Australia, July 2011. Regnum Vegetabile 154. A.R.G. Gantner Verlag KG. ISBN 978-3-87429-425-6. Archived from the original on 2013-11-04. ^ "Bellis perennis". Germplasm Resources Information Network (GRIN). Agricultural Research Service (ARS), United States Department of Agriculture (USDA). Retrieved 2011-06-05. ^ L. B. McCarty (15 January 2001). Color Atlas of Turfgrass Weeds. John Wiley & Sons. p. 102. ISBN 978-1-57504-142-1. Archived from the original on 2 May 2016. Pavord, Anna (2005). The naming of names the search for order in the world of plants. New York: Bloomsbury. ISBN 9781596919655. Retrieved 18 February 2015. Brickell, C.D. ; Alexander, C.; David, J.C.; Hetterscheid, W.L.A. ; Leslie, A.C.; Malecot, V.; Jin, X.; Editorial committee; Cubey, J.J. (2009). International Code of Nomenclature for Cultivated Plants (ICNCP or Cultivated Plant Code), incorporating the Rules and Recommendations for naming plants in cultivation (PDF) (8th ed.). International Association for Plant Taxonomy and International Society for Horticultural Science. Adopted by the International Union of Biological Sciences International Commission for the Nomenclature of Cultivated Plants. Plant botanical definition list. Retrieved 12 November 2016.